← BBC News: Are the benefits of TeleHealth a Myth? Dr Eric Topol, Dr Leslie Saxon, Dr Ben Freedman, Prof John Camm OR iMedicalApps Residents? I’m obviously a big fan of the Alivecor ECG device and the plethora of mHealth opportunities it will open up but it’s clear that not everyone has the imagination to see the possibilities that emerge when you combine medical technology with the low cost smartphones that billions of people already carry in their pockets. 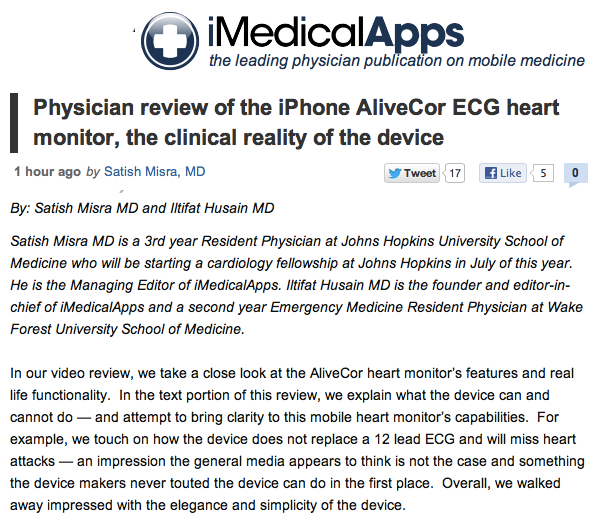 In their review of the Alivecor ECG device the iMedicalApps reviewers seem to once again be overly concerned with what they perceive to be “hype”. Ultimately like a lot of decisions that are made in Healthcare I think it’s going to come down to individuals making a judgement call. 1 Response to Dr Eric Topol, Dr Leslie Saxon, Dr Ben Freedman, Prof John Camm OR iMedicalApps Residents? David, I don’t perceive the Imedicalapps review of AliveCor as negative. I do agree with them that to date much of the discussion has been based on hype. We do need the healthcare industry to play a more active role in properly evaluating how the new technology can be used, and provide feedback for its future development. Few people can be as forward thinking as Dr Topol and Dr Albert, but in reality they will be the bulk of users, so we need to enable them to experiment with these technologies to discover use models that are relevant to them. That includes recognizing the limitations and determining which of these we are willing to live with, and which we want remedied. I look forward to more such articles, hopefully in the media that the bulk of healthcare providers and patients read. That way we can move away from the cloistered fan club mentality we have in MHealth today to making it generally available tool upon which clinical innovation can be developed.